Taurus Hill Observatory | Qatar-1b observed again at Taurus Hill Observatory. Posted April 7th, 2011 by Harri Haukka & filed under Extrasolar Planets. 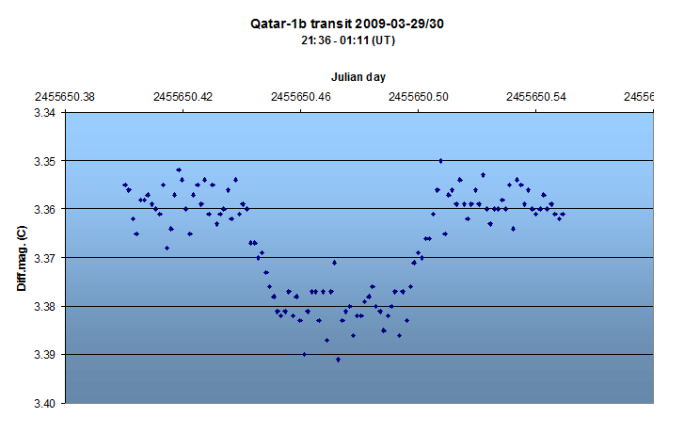 Taurus Hill Observatory research team observed Qatar-1b at Taurus Hill Observatory 29./30.3.2011. The duration of the transit was according the measurements 102.5 minutes and the dimmening of the mother star 23.5 mmag. The observation has been published in TRESCA database.